Chief executive of Manta Trust Guy Stevens has spent a decade unravelling the lives of the manta rays that inhabit the coral reefs of the Maldives. Here is some of what he has seen and learnt. Feathery gill plates encircle a manta’s gills and filter particles from the water that are larger than grains of rice. People often ask me why I decided to study manta rays. 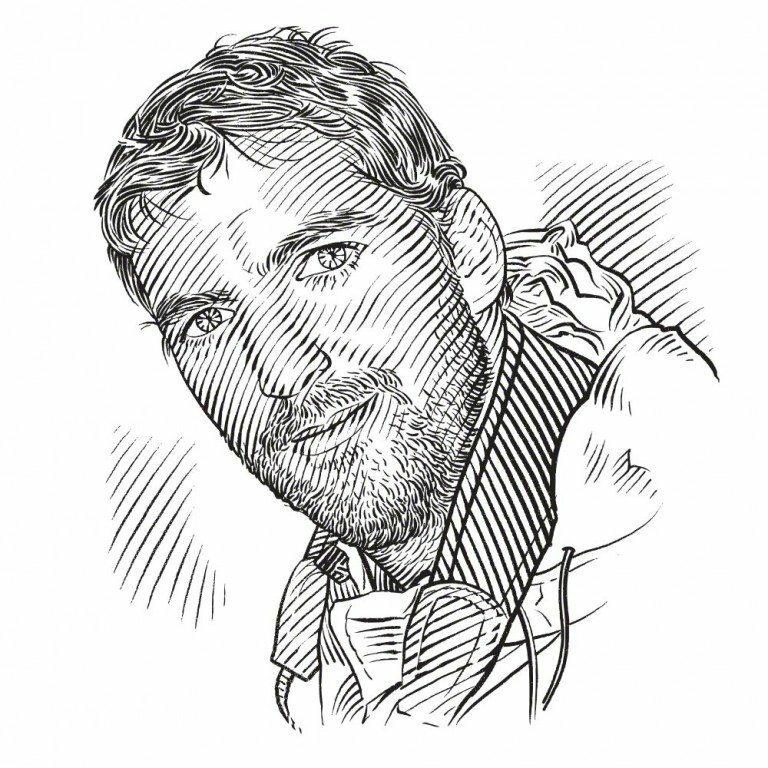 Why would a British marine biologist move halfway around the world to devote a decade of his life to unravelling the lives of the manta rays that inhabit the coral reefs of the Maldives? It is a good question, a seemingly simple question, yet one which I had not truly stopped and taken the time to consider until I was first asked many years ago. It is a question I still find difficult to answer satisfactorily with words today. Certainly, manta rays are beautiful creatures: their grace and inquisitive nature is captivating; they engage and stir my natural curiosity like no other marine creature, driving my desire to protect and learn as much about these poorly studied animals as possible. Yet to me these words never seem to fully express my passion, or satisfactor­ily project the empathy and connection I feel towards manta rays and their marine world. This is why my favourite answer does not require words, but simply an introduction between those who wonder why, and the manta rays themselves. For me, manta rays are the embodiment of nature’s majesty, they are the vehicle which draws people through the looking glass, opening eyes and minds. They captivate and connect people to our oceans, symbolising what is at stake if we choose not to respect and protect our natural heritage. In 2005 I founded the Maldivian Manta Ray Project (MMRP) which is now one of the longest running manta ray research and conservation initiatives in the world. 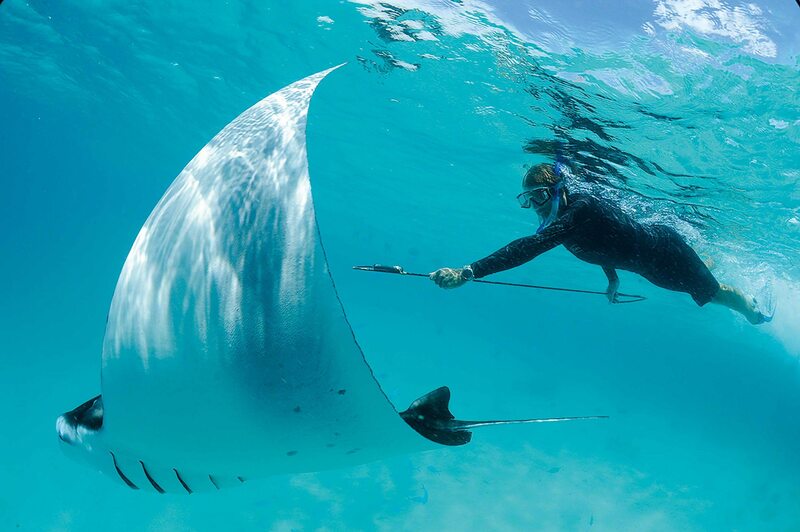 The MMRP was formed with a view to collecting long-term, robust data records on manta rays throughout the Maldivian archipelago to further their conservation. In addition to collecting data on the mantas encountered, the MMRP also collects data on environmental and climatic factors as well as tourism and human interactions, all of which influence the manta population. Like all cartilaginous elasmobranchs manta rays and their close relatives the mobulas have a skeleton comprised of flexible, fibrous and light cartilage as opposed to the dense bony skeletons of the vast majority of all other fishes. A close relative of all sharks and rays, mantas must constantly keep swimming forward in order to ensure a steady supply of oxygen-rich water flows over their gills; they can never stop to sleep or rest on the seabed. The first rays appeared in the oceans approximately 170 million years ago, radiating from shark-like ancestors but adapting to a more benthic mode of life. The flattened body shape of rays is essentially a squashed version of the archetypal shark, with internal physiology very similar to that of their shark cousins. It was from these bottom-dwelling rays that the ancestors of today’s pelagic mantas and mobulas evolved, taking to the open water around 20 million years ago. The defining feature of the manta and mobula family is that of filter feeding – they use their cephalic fins (head fins), huge mouths and modified gill plates to strain plankton and small fishes from the water. The cephalic fins, which when rolled up look like horns projecting from their heads, have given them the name ‘devil rays’. In general mobula rays are much smaller than mantas and can be distinguished by morphological differences in their mouths. Mobula rays have a bottom jaw which is undercut, so that when their mouths are closed the edge of the lower jaw rests much further back than the upper, whereas manta rays jaws are aligned evenly. The devil ray family contains 11 species of plankton- and fish-eating rays. Within this family there are two genera: Mobula and Manta. Very little is known about the mobula rays which, unlike the mantas, are generally very shy towards divers and make it hard for scientists to observe their natural behaviour in the wild. Like mantas they are found throughout tropical and sub-tropical oceans. Sometimes aggregating in vast shoals of many hundreds they come together possibly to feed or to seek safety in numbers. 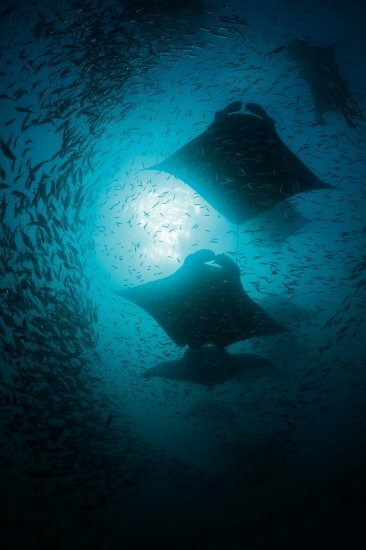 These aggregations may also occur more frequently at breeding times and it is not uncommon to encounter these large groups attracting attention at the surface as the rays leap several metres out of the water. There are currently nine described species of mobula rays, but the taxonomy of this genus is likely to change in the coming years as advances in genetics allow scientists working on these poorly studied animals to further define the true nature of the species composition within the genus. 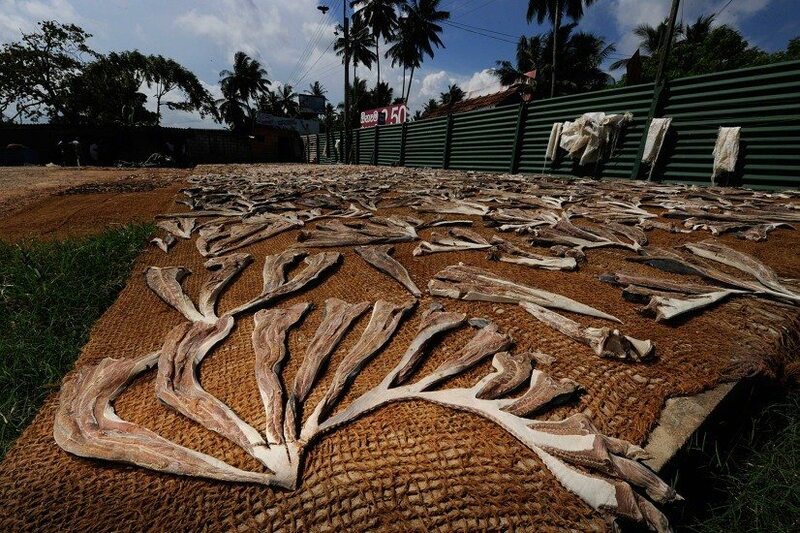 Fishermen and market traders weave their way through islands of fish that are sold to the highest bidders. The manta and mobula rays, being the lowest valued commodity, are the last to sell. Within the genus Manta there are currently two recognised species, Manta birostris (the giant oceanic manta) and Manta alfredi (the resident reef manta). These two species have much in common, but a few differences exist between the two. Mantas were re-classified as two separate species in 2009 based on a number of slight morphological features as well as differences in habitat utilisation and behaviour. Genetic work is continuing to further define the true nature of this separation. Like all elasmobranchs, but unlike nearly all the other fish in the sea, manta rays reproduce through internal fertilisation, which means male and female must come together to mate. They give birth to live young that are miniature versions of their parents; ready to fend for themselves, they are completely independent from birth. Courtship rituals and actual mating events are relatively infrequently observed and the only docu­mented accounts of a birthing manta ray come from a female housed in the Japanese aquarium at Okinawa. Many gaps still remain in our knowledge of the sexual lives of these fantastic creatures, and what little we do know is based on very little hard scientific data. Mantas are ovoviviparous, meaning that once they have mated the fertilised egg grows within the female’s uterus until it has developed into a fully functioning manta pup. In aquaria the time between mating and pupping has been observed to take around one year. Mantas usually give birth to a single pup, but occasionally two developing embryos have been recorded inside a pregnant female during autopsies. At birth mantas measure around 1.5 to 2 metres from wing tip to wing tip. It is thought that mantas are probably born at night, but to date no wild births have ever been recorded. 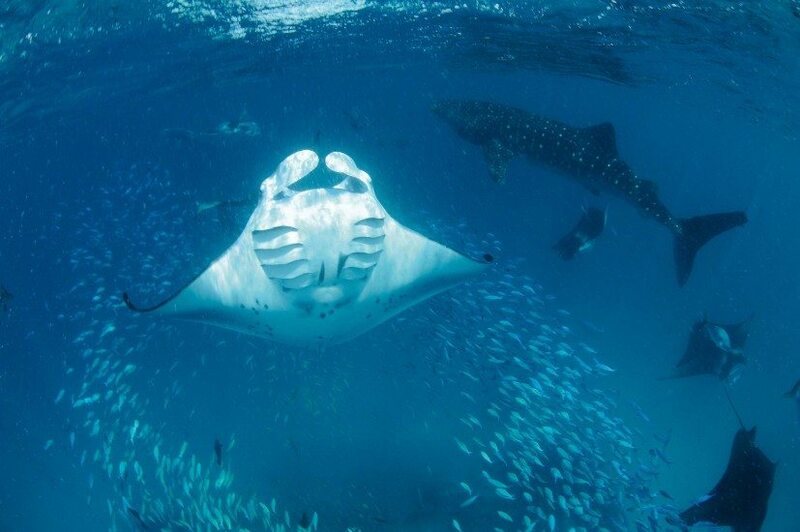 It is believed that mantas become sexually mature at around 10 to 15 years of age, possibly even longer for females. Currently it is not known how often females give birth, but the latest research suggests birth rates average around one pup for each mature female every two to five years. This extremely slow rate of reproduction, coupled with the long gestation period, late maturity age and small litter size, makes manta rays very vulnerable to exploitation. Research indicates that mantas probably live for around 50 years. However, until scientists have been studying these animals for several more decades we are unlikely to be able to answer this question accurately. A reef manta ray (Manta alfredi) swims in tight backward summersaults, looping over and over again as it feeds on a dense patch of planktonic prey, while snorkellers above watch the performance. Courtship in mantas can last days or even weeks and is an intricate process led by the female. The males compete to mate with the female, following her around the reef in what is known as a mating train; as many as 30 males may line up behind a single female. Watching a mating train of mantas is an enthralling experience, with the female leading the males as she races, twists, turns and dives around the reef with each male following her every move. In doing this the female tests the fitness of the males as they try to keep up with her and gain the first place in the train. At the end of this process the female selects a single male and the two mate as a pair, belly to belly in the mid water, the male biting down on the female’s left wing to secure them together. These bites leave permanent mating scars on the ends of the female’s pectoral fins where the ‘wing-tip’ is gripped by the male’s muscular pharynx at the back of his mouth. Just like humans, manta rays exhibit signs of lateralisation, with nearly all observed mating scars occurring on the left hand side of the females, suggesting the males favour this side of their body. Storm clouds loom on the horizon as the monsoon currents whip up the waves and drive plankton into the shallows where the mantas gorge themselves on the ephemeral windfall. Manta and mobula rays are known as filter feeders and this term most accurately describes the way in which these animals are able to consume their microscopic food. Ingeniously designed, devil rays are efficient and expert foragers, roaming the seas and oceans in search of food. Upon finding an abundant food patch the rays transform into feeding machines, unfurling their horn-like cephalic fins from either side of their giant mouths to act as a funnel. 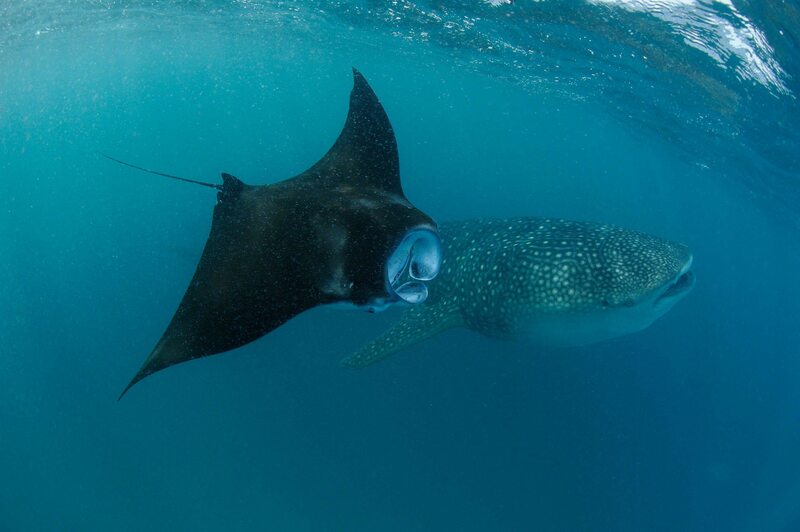 The once flattened body and mouth becomes a giant black hole with wings powering the manta through the water as countless litres flow in through the mouth and stream out over the five pairs of gill slits that line the throat of the animal. Plankton and small fishes (depending on the ray species) flowing over these gills are sieved out of the water and trapped by feathered gill plates. Once the plates have netted a mouthful of food, the ray closes its mouth and coughs, back flushing the trapped food from the gills into the back of its mouth before swallowing its mouthful of highly nutritional prey. 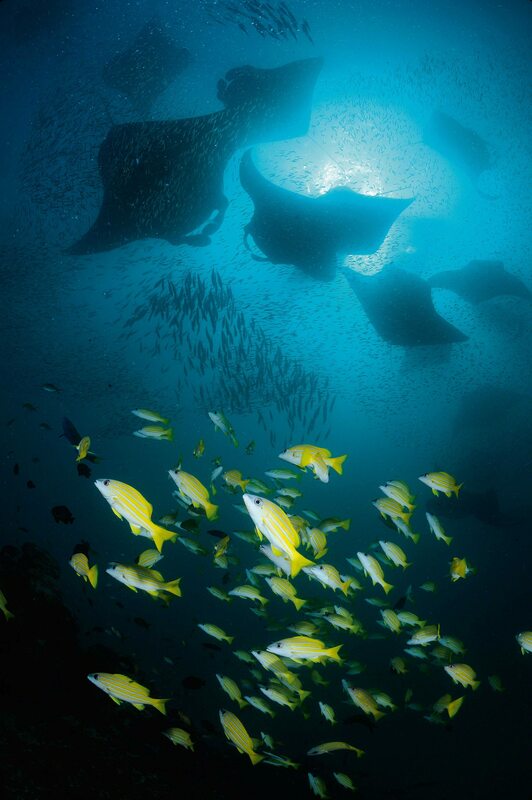 Spectacular mass feeding events like this occur about a dozen times a year inside Hanifaru Bay, where as many as 200 individual mantas feed together inside this small natural cul-de-sac of reef. As well as their physiological feeding adaptations the rays also employ a variety of behavioural feeding strategies and techniques to maximise the amount of food they can funnel into their mouths at each feeding event – manta rays barrel-roll through dense patches of plankton while speedy fish-eating mobula rays lunge at their faster moving prey with powerful beats of their pectoral fins. Unlike the mobula rays, which often feed more on larger prey items, the plankton-eating mantas spend a lot of time swimming around with their mouths wide open. As a result particles of food and detritus become lodged in their gills creating an unwanted build-up of dental detritus. Manta rays have no hands or appendages with which to clean or groom themselves, so instead they visit specific locations on a reef to have their bodies cleaned of parasites and dead tissue by small fish known as cleaners. 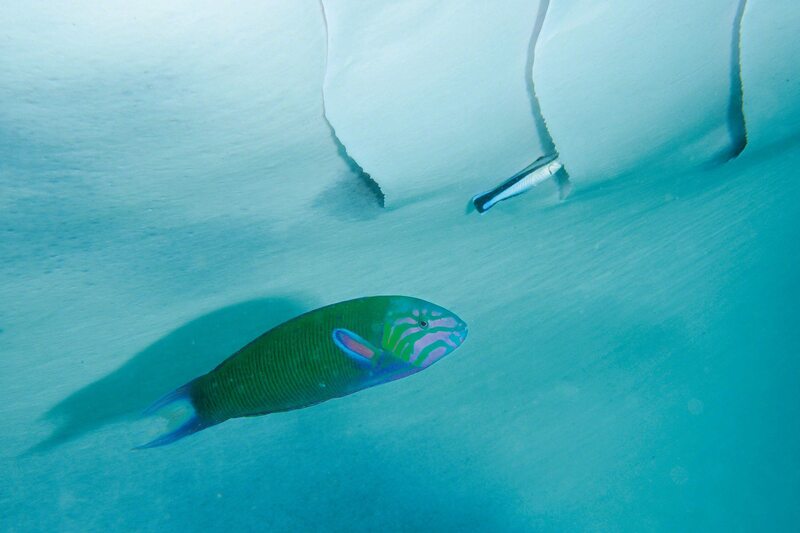 These cleaner fish are commonly wrasses although other fish families, such as angelfishes and butterflyfishes, also perform this task. 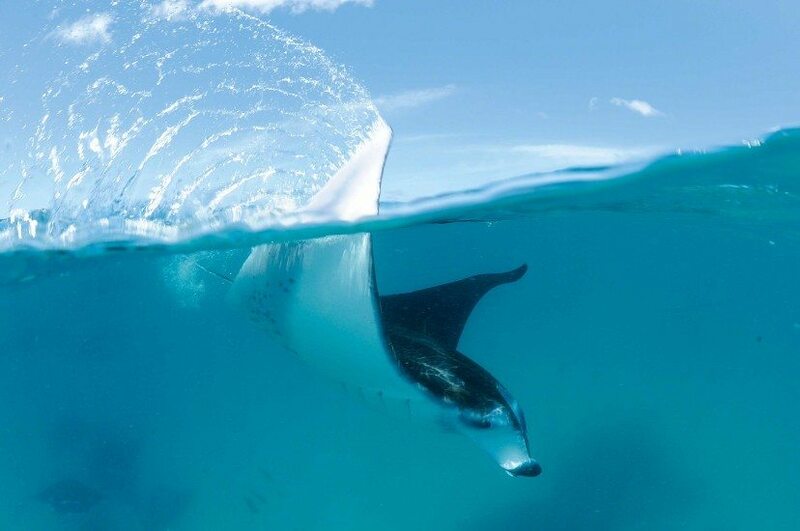 The relationship is mutually beneficial to both the manta rays and the cleaner fish, which receive their dinner served on a giant flapping plate. Specialised cephalic ‘head’ fins funnel plankton-rich water into a huge gaping mouth, where feathery plates line five pairs of gills that sieve the tiny planktonic manta food from the water. The flesh of manta and mobula rays has always been considered to be of relatively poor quality by humans around the world. As a result these animals have not been widely targeted for human consumption through commercial fisheries in the past. However, in recent years this has changed. Manta rays and their close relatives are now rapidly becoming a more desirable product, making them a target for fishermen in the tropical and temperate oceans of the world. The reason for this sudden change of fortune for these unfortunate rays is a tale of depressing repetition played out in our oceans and throughout our planet on a regular basis. The difference this time is that the latest targets are the mantas, which are paying the price of becoming the latest commodity in the often senseless and environmentally destructive Chinese medicinal trade. 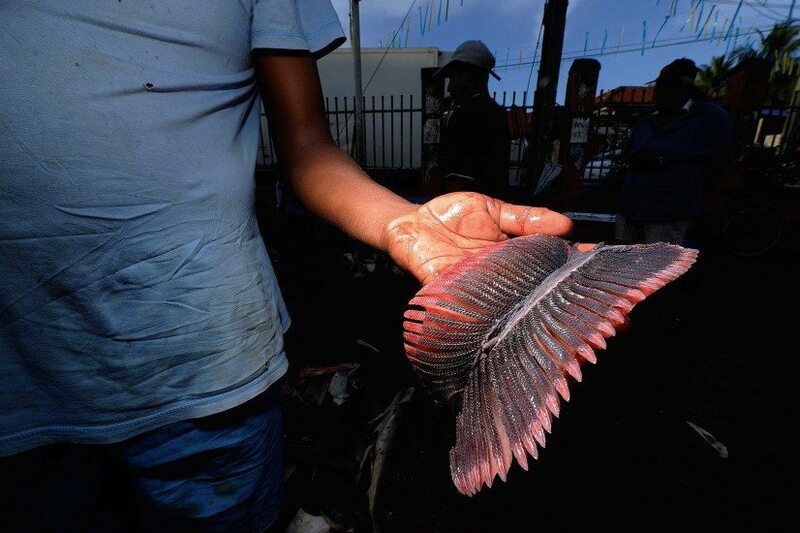 The ray’s feathery gill plates have become a product generating an estimated market value of US$11 million annually. In the Maldives manta rays have never been fished commercially and are not consumed locally because their flesh is considered poor quality and there have always been ample stocks of more desirable food species. 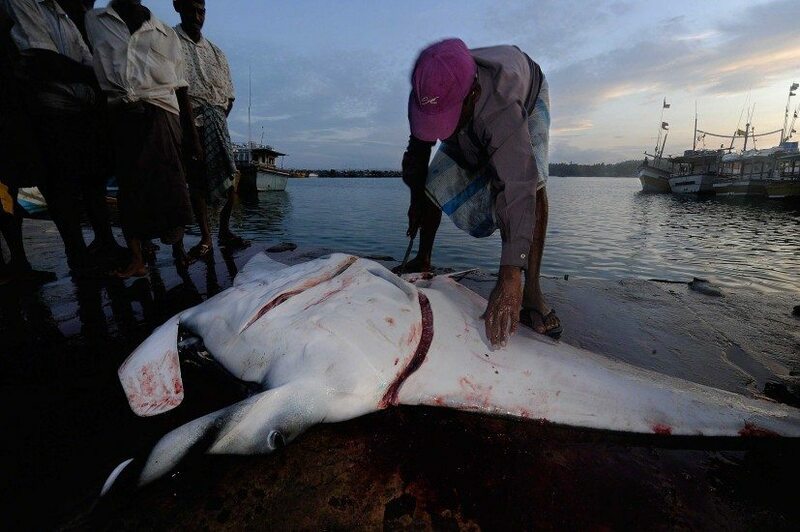 Since 1995 it has also been illegal to export any ray products from the Maldives, thus effectively preventing any gill plate export fishery from occurring there. Unfortunately, a short distance across the Indian Ocean in Sri Lanka manta rays and their close relatives do not receive the same level of protection and are being targeted in vastly unsustainable numbers – they are selling the low quality meat for local consumption and exporting the gill plates to supply the medically spurious Chinese medicinal trade. The oceanic mantas are the last to be sold each morning. 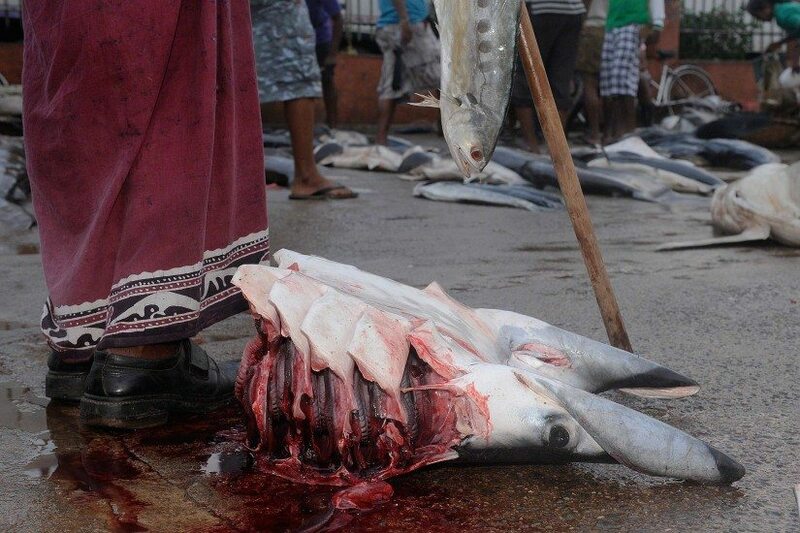 Gutted and chopped in half at sea in order to allow such a huge fish to be hauled onboard the fishing vessel, the two halves of the ray are temporarily re-united before the purchased carcass is butcher­ed and the valuable gill plates removed from its head. Data collected on this fishery in Sri Lanka estimates many hundreds of manta rays and tens of thousands of mobula rays are being killed each year by this country’s fishing fleet, which travels far into the Indian Ocean in search of fresh fishing grounds. 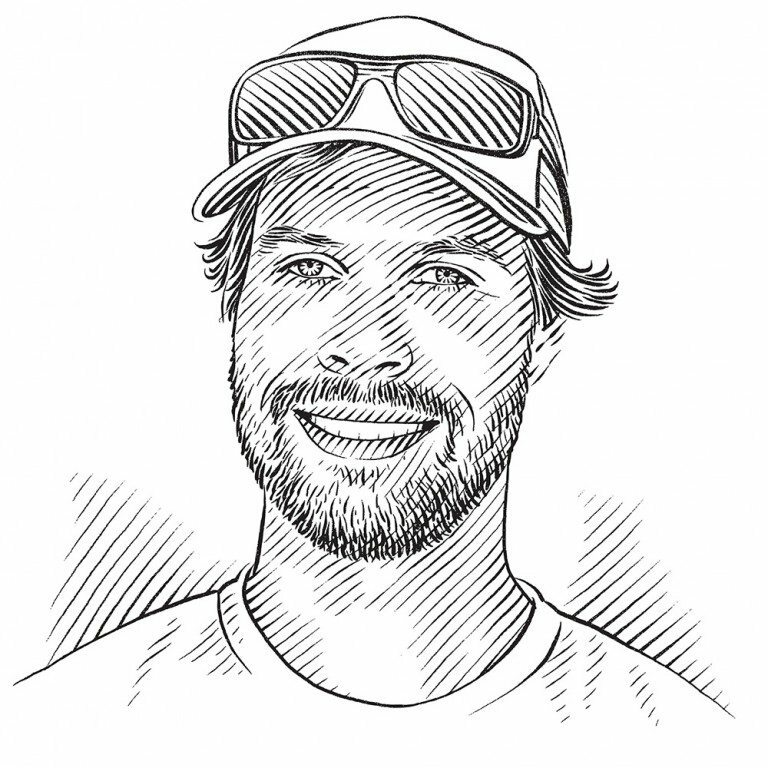 When certain aspects of manta and mobula rays’ biology – such as their low reproductive rates, slow growth and late maturity – are taken into account, these high catch rates are likely to have significant impacts on the respective populations in this region. If the fishing of manta and mobula rays carries on at its existing levels globally it is highly likely there will be population crashes of these species within a few years. Regional population crashes have already been documented in the Gulf of Mexico and Indonesia, where boom and bust fisheries for these species have occurred in recent decades. 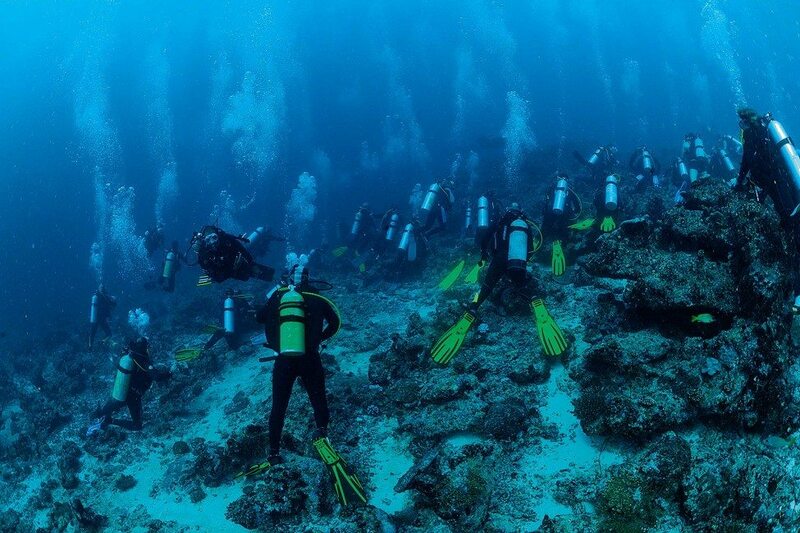 Divers and snorkellers flock to manta ray cleaning and feeding sites, collectively spending more than US$8.1 million annually in the Maldives alone in search of their own underwater encounter with these captivating animals. 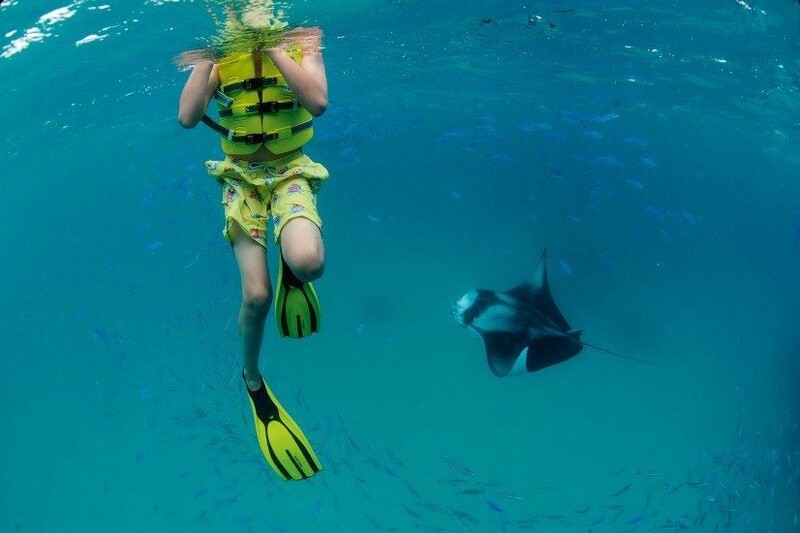 The mantas’ giant size, inquisitive and peaceful nature and their propensity to frequent tropical shallow reefs has facilitated a burgeoning tourism industry in many nations around the world where enthralled divers and snorkellers seek out the thrill of an underwater encounter with these fascinating creatures. 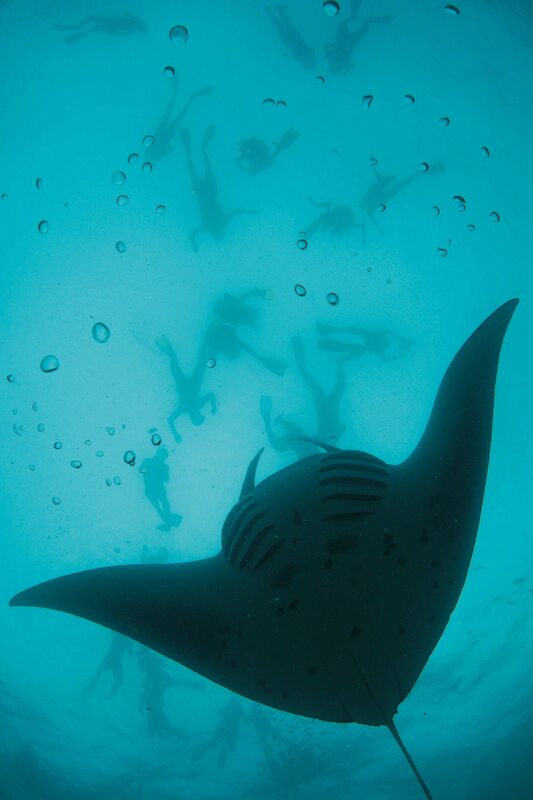 Globally it is estimated that this tourism industry generates US$140 million annually, with the Maldives’ manta ray tourism industry alone generating more than US$8 million annually through direct revenue from manta dive and snorkel excursions. Unfortunately, in today’s commercial and increasingly crowded world a country’s marine resources must pay their way. It is just not realistic to expect governments or communities to protect a species and its habitat for its intrinsic or ecological value alone. There must be a short-term financially viable alternative to incentivise a move away from destructive and unsustainable practices, regardless of the long-term ecological and economical losses of such practices. 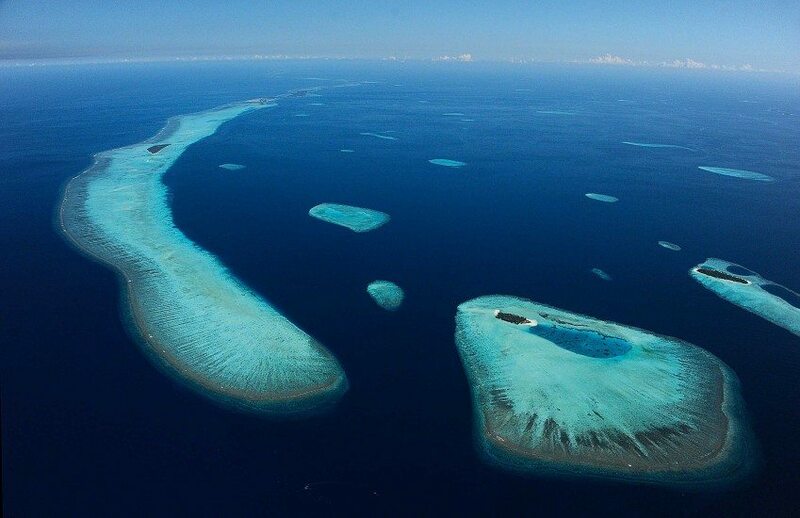 By looking at the Maldives as an example we can see that while tourism does bring with it its own set of new problems, these are vastly more acceptable alternatives to the current rapid depletion of the country’s marine resources through direct fisheries. A bright orange Maldivian clownfish watches a cleaning manta ray, safe within its home among the tentacles of a magnificent anemone, while a male ember parrotfish patrols his territory on the lookout for rival males. In the past 10 years scientists have made a good start at uncovering the secret lives of manta rays, however we are only just beginning to glimpse below the surface. Much still remains to be found out about even the basics of their biology, and with the largest brain to body ratio of all the world’s fishes, there is much still to understand about their intelligence, curiosity and social interaction. Learning more about these species is vital to being able to provide them with effective protection and ensuring their persistence in years to come. I hope I never tire of seeking the answers to the unanswered questions, and that by sharing my knowledge and passion I can promote imaginative thought and empathy in others, so that together the science and conservation of manta rays will be driven forward. 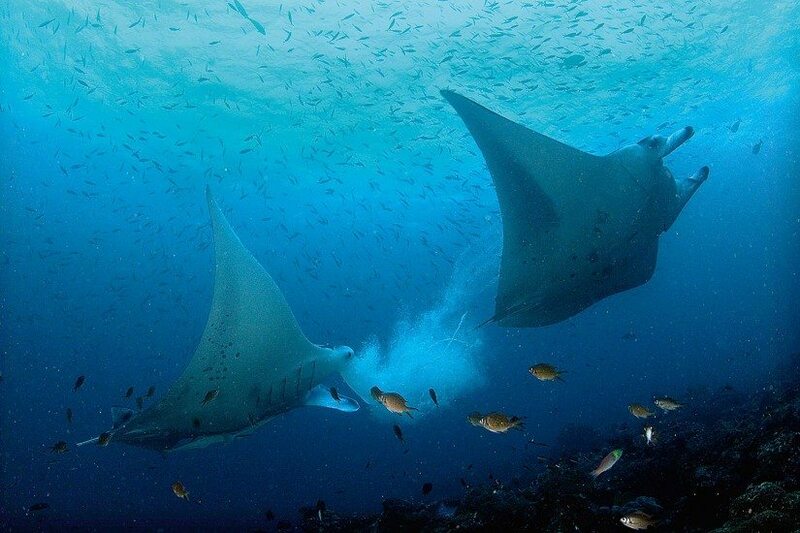 Manta rays deploy a variety of feeding techniques to maximise their feeding rewards. Some barrel-roll through dense patches of plankton backwards, like a dog chasing its tail, while others swim in straight lines along current lines that concentrate the plankton. The Maldives has the world’s largest known population of reef manta rays (Manta alfredi). Since the MMRP began its research it has identified more than 3,000 individual manta rays from some 25,000 photo-ID sightings. It is possible to identify every individual because each manta has its own unique pattern of black spots on its predominantly white belly. These patterns do not change throughout the lives of the mantas, enabling us to track each individual as it is sighted over the decades. Every manta sighting – whether of a new manta or a re-sighting of an individual that is already known – is an important piece of a huge jigsaw puzzle enabling us to better understand the population size, composition, migratory routes, reproductive output and areas of critical habitats, all of which is crucial information in developing effective management and conservation strategies for these increasingly vulnerable animals. 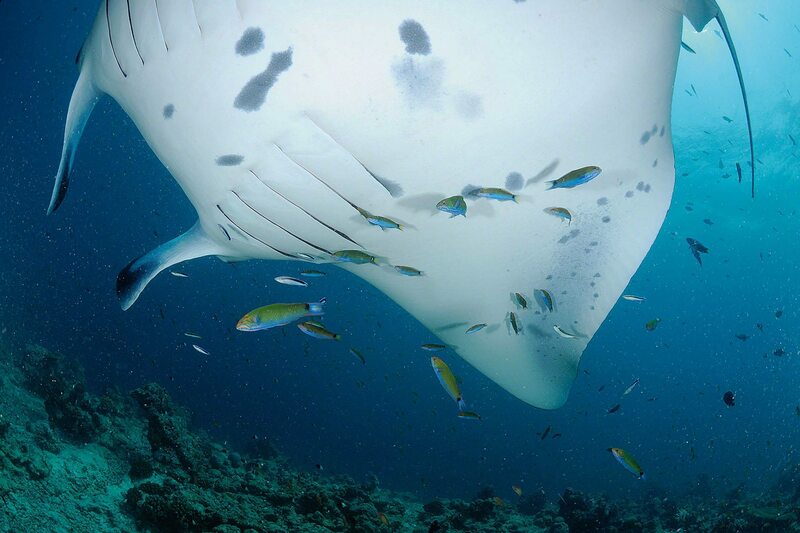 The long-term data collected by this project means the population of manta rays throughout Maldivian waters is one of the most intensively studied populations of manta rays globally, and allows the MMRP’s researchers to record and identify key trends and patterns within this population over time. Manta rays are an incredibly important economic resource for the Maldives, attracting tens of thousands of people to the country each year to dive and snorkel with them and generating millions of US$ for the economy annually. Being able to pinpoint the reasons for any observed trends in, or threats to, the Maldivian manta ray population and improving our understanding of these animals is crucial for the on-going management and protection of these animals, not just in the Maldives, but globally. 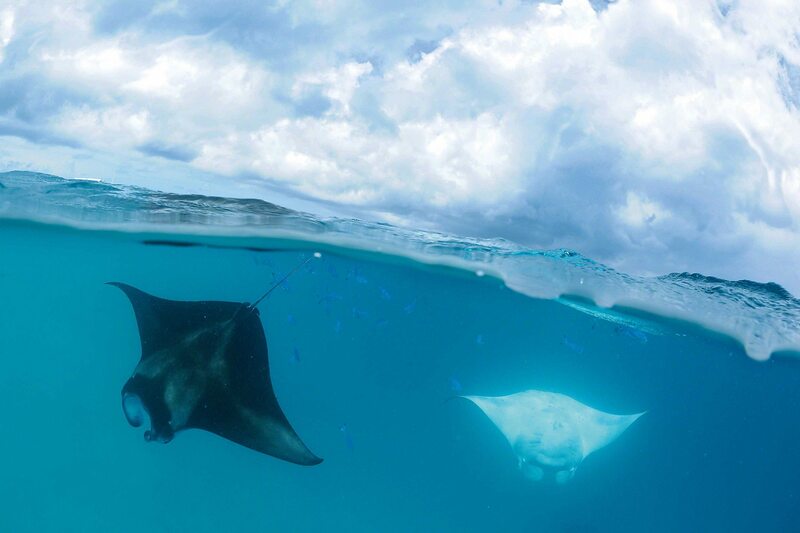 Having started out in the Maldives, the Manta Trust is now active in about 16 countries worldwide promoting the conservation of manta and devil rays and their habitat through research, awareness and education. Three of its current major operations are the Global Mobulid ID Project, which aims to provide a taxonomic, morphological and genetic identification guide to manta and devil rays; the collection of data about ray landings in India, which will inform conservation management in that country; and the Indonesian Manta Project, which works to promote an appreciation of manta and devil rays among local people.